I want to work out three hours a day. I want a body by Jake. I want to have self-control and to not eat sugar or drink diet Pepsi or artificial sweeteners. at the same time, i question the happiness of organic people. i have friends who have given up dairy. i have friends who have given up gluten and wheat. i have friends who have given up processed sugar and flour. my question is: what is left? i heard a comedian who said: i have diabetes. i had to give up glutton. i have no idea what glutton is, but it is delicious. I have to take medication that i have to take with either food or milk. if medicine needs to be taken with milk, why is milk so bad for you? of course the drug I take is incredibly strong and it is shrinking a growth in my head and it causes extreme side affects. or maybe not. may be this whole time the side affects have been from milk. who knew? maybe my tiredness is from dairy. look at cows… they barely move. they will stand there in the wind and the snow just getting covered. they would be much warmer if they moved around and got the blood flowing and yet they just stand there. maybe what is keeping me from working out three hours a day isn’t the fact that i have three kids who keep spreading sickness so that i can never use the nursery in the gym or the fact that i have to actually find three hours to exercise. maybe what is keeping me from working out is dairy. it makes me want to just stand in the wind and the snow and chew cud. not move at all. and beef is supposed to be bad for you too. it gives you cholesterol and high blood pressure and it has fat and if it isn’t cooked properly you get diseases and even if it is cooked properly, you can get mad cow. 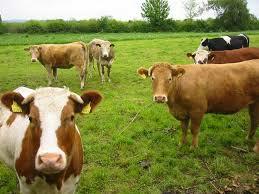 maybe we should get rid of all cows. maybe we should use them in catapults like Monty Python did. perhaps that is why god made them. they are not to be used for milk and meat, but as a weapon. if we start catapulting them at bad guys, not only would they get injured from having a large animal hit them, but they may get mad cow if they decide to eat it. win=win. I’m gonna call obama. or jack bauer.